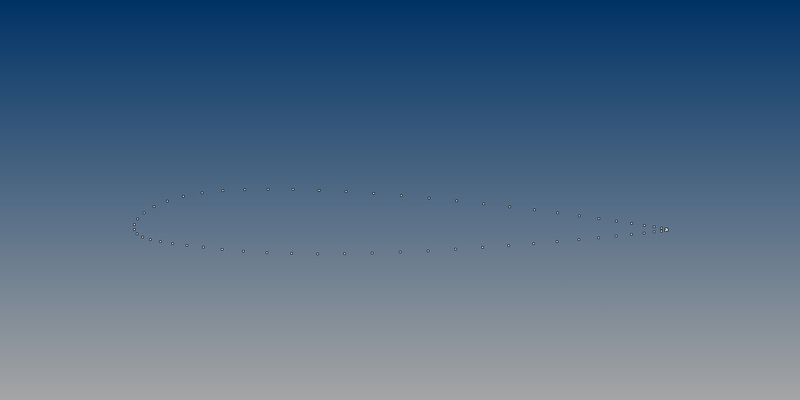 These are the raw points for a NACA 23012 airfoil. I chose it simply because it’s still in use today on lots of aircraft – namely lots of Cessna business jets. Now, people think that airfoils are complicated, but really they are quite simple. They are the addition of two mathematical curves – a camber deflection, and a thickness distribution. Allow me to explain graphically. 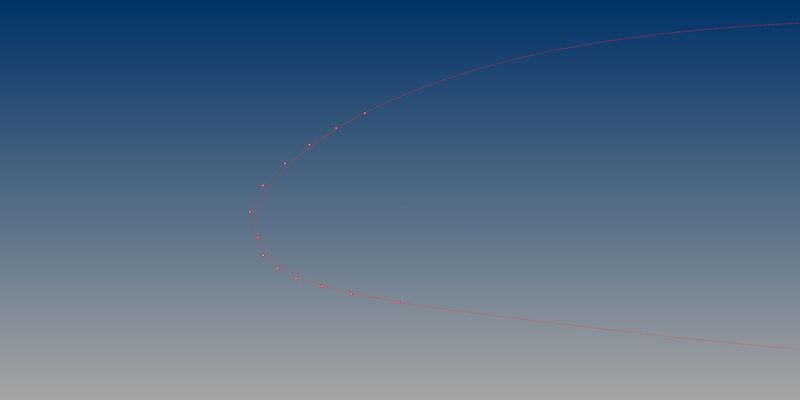 Again, the best thing I can say is, “it’s not horrible.” And, when you go to actually make things that attach to a wing lofted with this curve, you’re going to propagate those curvature wobbles into the resultant surfaces. 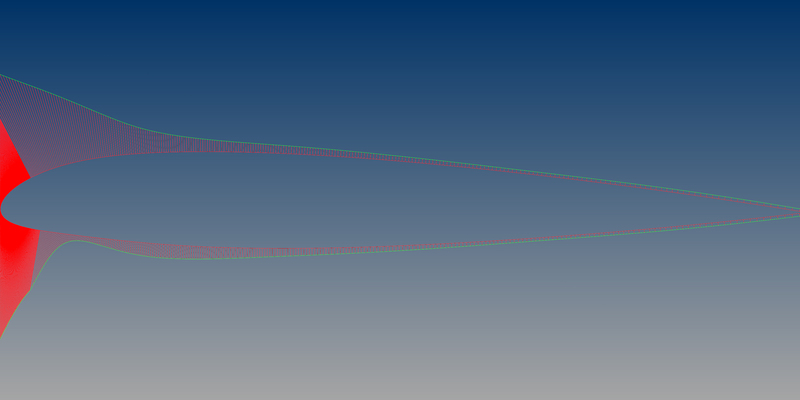 Better to make a new airfoil from scratch. Trust me, any time you invest in creating nice smooth airfoils will pay off huge on the back end. I want you to think of what the Platonic ideal airfoil would look like, especially in terms of it being smooth, and how the curvature graphs would look. This whole post revolves around two very simple tools – point editing/manipulating degree and point count, and the use of curvature graphs to analyze our work. So, imagine in your head what this ideal airfoil would look like, especially the curvature combs. They would peak at the leading edge, and then very smoothly fade out as you travel aft, right? The NACA 23012 is a little odd in that with that drooped nose, it ALMOST creates a flat spot on the bottom, about 15% in from the nose. You can see the curvature dips, rises, and then fades. 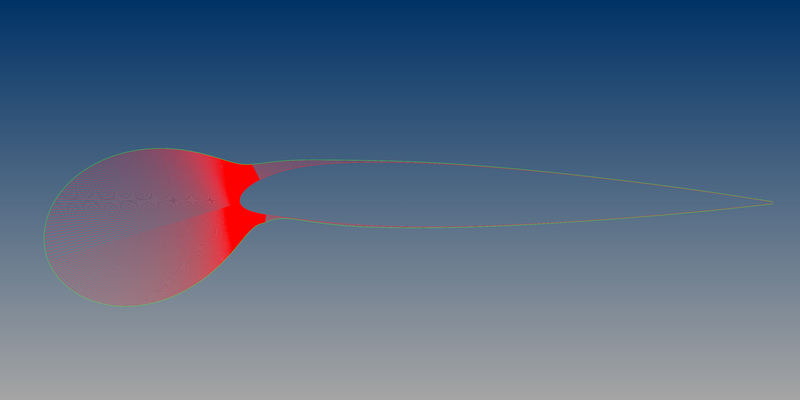 So, in this case, we would want that feature to be there too of course, but we want our airfoil to be smoother, and ideally with as few points as possible. 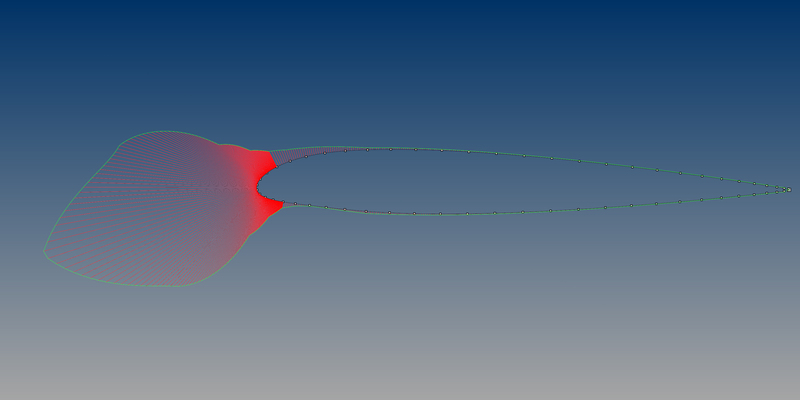 That ideal airfoil, in your head, should look like this, right? I’m always blown away in my work how many terribly drawn airfoils I see, because really when you get down to it, making proper airfoils doesn’t take fancy or expensive software. Really, it’s just rebuilding curves, point editing them, and constantly checking your curvature graphs. But, you can’t really sell that as a software package, so we get all sorts of “smoothing” plugins and automatic airfoil conversion plugins. Trust me, there is no purpose to those tools, they will only serve to make your life harder. Rebuild. Point Edit. Check your curvature. Done. Nice to hear from you again Sky and thanks for the great article! Nice to see you back at it again. Thanks for the article. Nice to see you back at the blog. 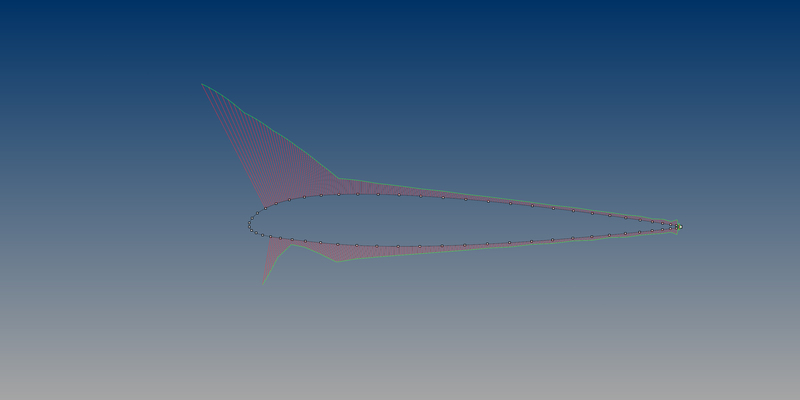 I modeled a hydrofoil parametrically in grasshopper with anhedral, and used the curvature of the leading edge of the wing (not airfoil) as a function to determine the spacing of 2d airfoil profiles along the span, before lofting. 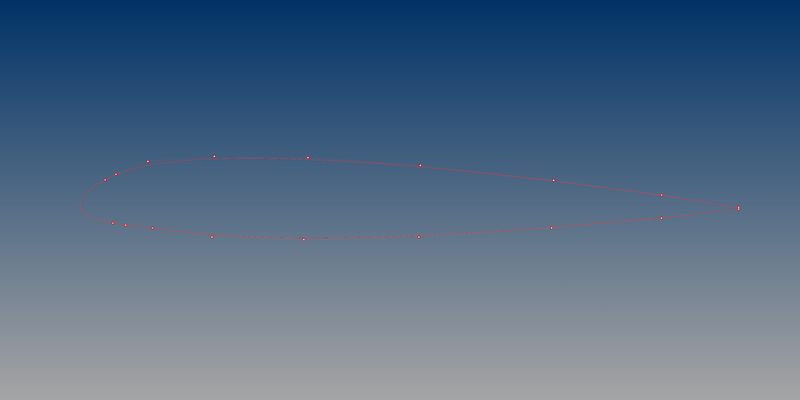 Strikes me the same function could be used to set the point spacing when drawing a 2d airfoil. I will have to check it out. You could use the naca math to specify the curve and then space points accordingly. Other foil profiles would be harder to model if they do not have a mathematical curve definition. But it could still give a nice smooth variable point distribution that could be manually adjusted. And what happened to tsplines? Can you define the types of work for which you still find it useful? Karl – I’d love to see what the result is, in terms of the smoothness of the curvature of the resultant curves, so if you give it a shot drop me a line. In terms of T-Splines – I’ve just found that I can do what I want faster and better with Shape, and plugin that Autodesk has killed…sigh. 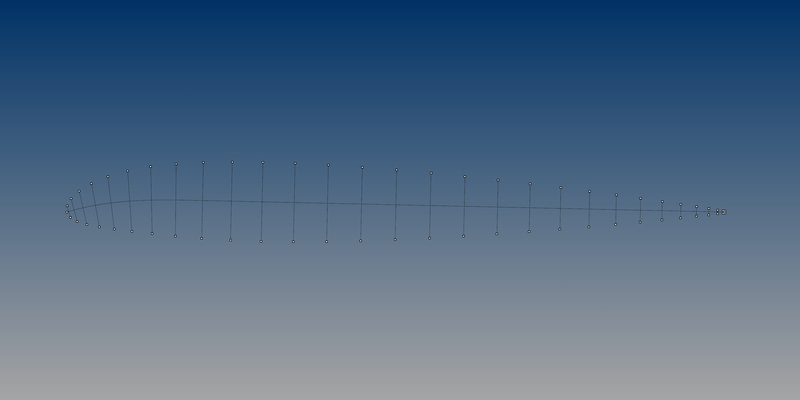 Anyway, I find that I can get smoother surfaces using Shape vs. TSplines, and so I use that now exclusively.